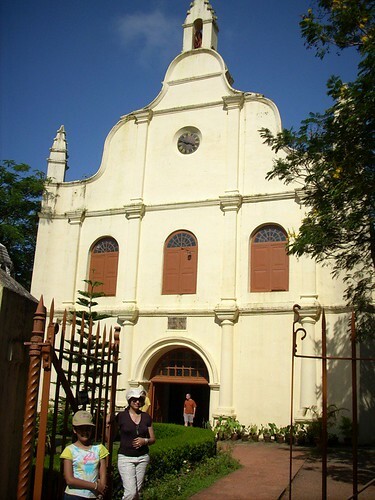 “Image: Fort Cochin: the church where Vasco da Gamma was buried. India: the last air-conditioned zone is the airport. Outside the airport what I will find from now on is just fans. The weather is overwhelmingly hot, it makes me relax and abandon myself to what happens around me. People are just like the weather; warm, friendly, passionate and very relaxed. Around me, lots of colors!! The traditional clothing for women, the saaree, is made of 6 meters of multi-colored fabric and is a treat for the eyes. People smile a lot and never say no. When I need some information I have to ask twice, because Indians prefer to never give negative answers. Fortunately, Indians have a very rich social life and are always well-informed and in contact with everything that happens around them. There is a special nodding that looks a lot like “no” but it actually means “yes” ). 🙂 They’re adorable when they do it, especially for allowing and approving. Men show their friendship by holding hands. It comes naturally and has no sexual connotation whatsoever. Nonetheless, psychologically speaking both feminine and masculine roles are clearly distributed in the relation. I try a hitch-hike but several rickshaws suddenly appear. The rickshaw is a 3-wheeled vehicle, a curious mix of a carriage with a motorbike or bike and it has pedals also. It is used just like a taxi. So I get in the rickshaw and the driver is very kind and friendly. He is even willing to give up the ride when he sees a taxi coming my way. Because the traffic is insane, crossing the street is a real adventure! The rules on the road are the same like the British ones: they use the left side of streets and the steering wheel in on the right. They respect this rule sometimes. It seems to be the only traffic rule. There are no policemen in the streets, but their drivers are really good at it. The toilet is oriental. There is no toilet paper, Indians prefer to wash themselves. As a matter of fact the majority of the planet’s inhabitants use this more healthy method. Because they use the left hand in the restroom it becomes a taboo once at table. They use the right hand for eating. The left hand is used only for taking a bottle or handling other utensils.